The Michigan Wolverines football team is currently 3-0, ranked No. 8 in both the AP and Coaches Polls, averaging 33 points per game while only giving up an average of 15 points per game. You wouldn't know it talking to a large portion of the fanbase, though. To hear them tell it, Michigan is 0-3, unranked and can only score field goals on a consistent basis against the "worst" opponents in the country. That's a lot of hyperbole and exaggeration, but this is what a lot of Michigan fans are exuding right now with an undefeated team just three weeks into the season. As far as fan reactions go, this might be the most polarizing 3-0 start to a season for a fanbase as large as Michigan's with some people saying redshirt junior QB Wilton Speight needs to immediately be benched in favor of sophomore Brandon Peters or even freshman Dylan McCaffrey, and others saying that anyone doubting this team in Year 3 is not a "real" Michigan fan and should go root for someone else. We've even got fans booing the team at Michigan Stadium and questioning the coaching staff, including head coach Jim Harbaugh's ability to recruit and develop talent, especially at the QB position. You know, the position he played for three years at Michigan and for 14 years in the NFL? Right. The incredibly irrational and highly irritating criticisms being levied by a lot of Michigan fans at the team right now are a thing to behold in itself, but the recruiting and development aspect is one that seems to come up more often than not lately. Many pundits predicted going into the 2017 season that Michigan would be an 8-4 to 9-3 team with just too much talent to replace on both sides of the ball, especially the defense that lost 10 starters to the NFL draft. So far this season, the defense has been nothing short of elite and is challenging to potentially being even better and certainly faster than last year's unit, but the offense has had its struggles with consistency in the passing game and the red zone, scoring just one red zone touchdown out of 10 red zone possessions so far this year. The game against Air Force seemed to be the biggest culprit of this with sophomore kicker Quinn Nordin having to hit five field goals during the course of the game because Michigan failed to convert on third down. Michigan won the game 29-13, but questions mounted among the fanbase as to why in Harbaugh's third year at Michigan he doesn't appear to have the juggernaut that many fans and others with higher expectations than 8-4 or 9-3 seem to think that he should. It was also noted before the season by many that two of Harbaugh's most notable coaching peers, Alabama's Nick Saban and Ohio State's Urban Meyer both won national championships at their respective schools in Year 3 of their tenures there. This has no doubt added fuel to the fire of those who think Harbaugh should be on the track to do the same at Michigan this year, and are more than frustrated that his team doesn't appear to be offensively......even though they are 3-0 and have won every game by an average margin of 18 points. Let's put aside the sheer lunacy of a lot of the fanbase's complaints three weeks into the season and look at the "Year 3" argument a number of them are using. The contention here is that Year 3 is the time when a coach no longer has a majority of players from the previous regime that he didn't recruit himself and now has a team full of his own recruits that have spent two years in his system and are ready to perform. This is a solid and viable plan for success, provided that your first recruiting class is strong enough and talented enough to carry out that plan on the field in Year 3. While there is no doubt that Michigan has a great deal of talent on the field this season, there is a notable difference between what Harbaugh has on the field this year and what Saban and Meyer as examples had on the field in their third years. In both cases, Saban and Meyer had classes of 25 kids ranked as a Top 10 recruiting class. These were the first classes for each coach that were expected to take the reigns for Alabama and Ohio State two years later and they did with Alabama going 14-0 and winning the national title in 2009 and Ohio State going 14-1 to win the national title in 2014. Notice anything different? Not only was it a much smaller class but it was also ranked middle of the road and it wasn't for a lack of talent among the players in the class, it was purely for lack of numbers. 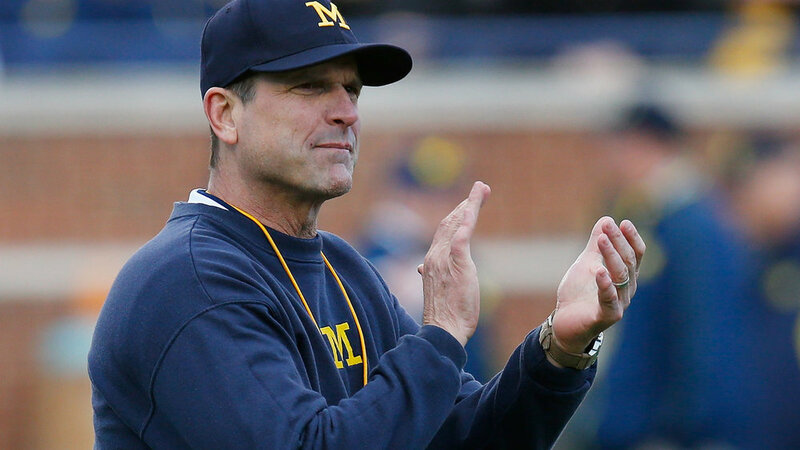 See unlike Saban and Meyer, Harbaugh came into Michigan on the heels of a decommitment exodus. Eight highly ranked players left the recruiting class before Harbaugh was even hired on December 30, 2014. He had two weeks to do what he could to salvage what he had and made the most of it, but was unable to get Mike Weber to swing back to Michigan from Ohio State and couldn't flip any other four or five star recruits so late in the game, though it wasn't for lack of trying. Now, true to the Year 3 argument logic, most of this class that is still around IS on the field this year taking the reigns. Junior Grant Perry might be Michigan's current best receiver, junior Karan Higdon is one of our best running backs, Nolan Ulizio is starting on the offensive line with Jon Runyan pushing to crack that lineup as well, Tyrone Wheatley is one of the leaders of the tight end stable along with Zach Gentry and Tyree Kinnel is arguably our best athlete in the secondary. Defensive end Reuben Jones is also in the defensive line rotation as well. A notable loss here though is offensive tackle Grant Newsome, who went down with that serious injury in the Wisconsin game last year that nearly cost him his leg. He's making incredible progress rehabbing it now but if he were healthy, he'd be on that starting O-line for certain as one of the best we have. The other five recruits in this class that haven't been mentioned, defensive end Shelton Johnson, cornerback Keith Washington, wide receiver Brian Cole, QB Alex Malzone and kicker Andrew David all transferred prior to this season. So out of an already small class of 14, half are still at Michigan to carry the upperclassman workload for the team and one is out for the year rehabbing an injury. There are plenty of other upperclassmen carrying the workload for the team on the roster including Speight but they were all Brady Hoke recruits, not Harbaugh. In fact, there are more players left from Hoke's final class in 2014 (12) than there are from Harbaugh's first class in 2015. If you want to make the case that the presence of those players, almost all of whom are playing significantly for this team are the reason Year 3 should be dynamite for Harbaugh, that's a discussion to have with the caveat that he didn't recruit them initially, though as Meyer said recently in a rare moment that I agree with him, once you sign the contract they are your players. Harbaugh certainly sees it the same way, as he should. The bottom line here is that the "Year 3 with his own players" argument doesn't work for Harbaugh because of the tough situation he was put in with the low numbers on that first class, especially since it only had one QB that ended up transferring because he couldn't crack the lineup. His first true QB recruit is the sophomore Peters and his second is the freshman McCaffrey. They're waiting in the wings, but when you have two upperclassman QB's in Speight and senior John O'Korn who both earned their positions over Peters and McCaffrey, there's no reason to throw underclassman QB's into the fire. Alabama avoided it by starting junior Greg McElroy in 2009 and the only reason Ohio State didn't avoid it and started J.T. Barrett as a redshirt freshman in 2014 is because senior Braxton Miller went down with a season-ending injury during fall camp. Now again to be fair, the argument could be made that a Year 3 featuring nine Brady Hoke recruited upperclassmen from the 2014 class, combined with the seven upperclassmen from Harbaugh's first class in 2015 should be enough to have a great year, but then you might also have to acknowledge the fact that Brady Hoke did recruit some solid talent and that Michigan is in fact still undefeated and currently having a successful season despite all of the caterwauling and whining being done about offensive inefficiency three games into the season. No one is saying there's no work to be done on offense, but it certainly isn't the dire situation so many fans are making it out to be.